Fall in New England is my favorite time of year. As the leaves start turning colors geese head south for the winter. But did you know that we can learn a lot about leadership and teamwork from geese? It’s true! Animals can teach us valuable lessons about life. It is truly amazing how humans can relate to them just by observing their behavior. Many years ago, I was given a copy of “Lessons from Geese” as part of an organizational leadership program I was enrolled in. To this day, it is still my favorite leadership analogy. The story was written in 1972 by Dr. Robert McNeish, a science teacher from Baltimore, Maryland and has since been used as a study lesson by many leadership institutes, consultants, organizations, and corporations. We all know how important leadership and teamwork are in today’s organizations. We can use the five principles presented in the “Lessons from Geese” story as inspiration to practice good leadership and teamwork skills as we implement Lean. As each goose flaps its wings it creates an “uplift” for the birds that follow. By flying in a “V” formation, the whole flock adds 71% greater flying range than if each bird flew alone. Lesson: People who share a common direction and sense of community can get where they are going quicker and easier because they are traveling on the thrust of one another. 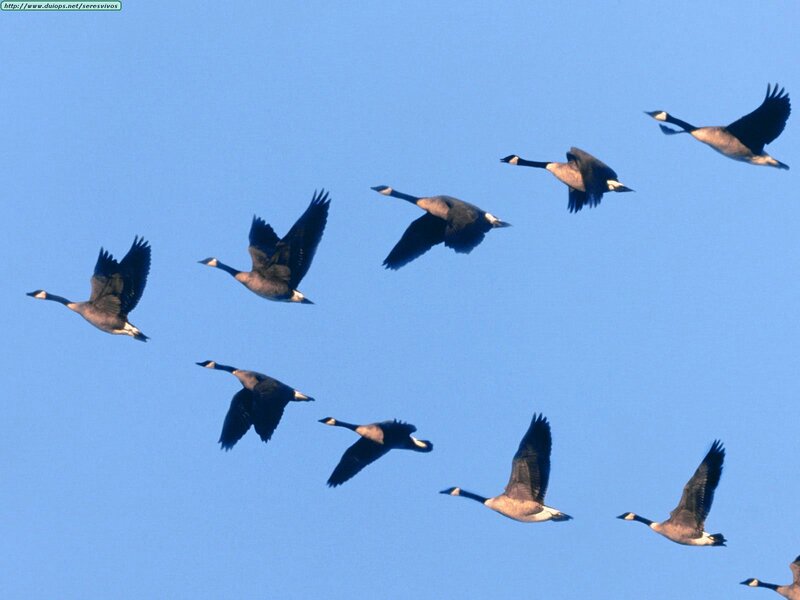 Lesson: If we have as much sense as a goose we stay in formation with those headed where we want to go. We are willing to accept their help and give our help to others. When the lead goose tires, it rotates back into the formation and another goose flies to the point position. Lesson: It pays to take turns doing the hard tasks and sharing leadership. As with geese, people are interdependent on each other’s skills, capabilities and unique arrangements of gifts, talents or resources. The geese flying in formation honk to encourage those up front to keep up their speed. Lesson: We need to make sure honking is encouraging. In groups where there is encouragement the production is much greater. The power of encouragement (to stand by one’s heart or core values and encourage the heart and core of others) is the quality of honking we seek. When a goose gets sick, wounded, or shot down, two geese drop out of formation and follow it down to help and protect it. They stay with it until it dies or is able to fly again. Then, they launch out with another formation or catch up with the flock. Lesson: If we have as much sense as geese, we will stand by each other in difficult times as well as when we are strong. "Lessons from Geese" provides a perfect example of the importance of team work and how it can have a profound and powerful effect on any endeavor. When we use these five principles in our personal and business life it will help us to foster and encourage a level of passion and energy in ourselves, as well as those who are our friends, associates, or team members. This is a great, thoughtful message on how we all relate to each other. It carries a strong theme of cooperation and teamwork empowering us to reach individual as well as shared goals.